Things that I enjoy are kayaking, riding our Harley, most anything where I can be outdoors, stamping, all sorts of paper crafts, scrapbooking, cardmaking, stained glass, and learning new crafts. 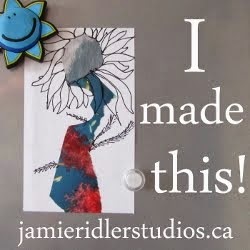 Jamie Ridler Studios- I Made This Mondays! Yesterday, I was listing a bunch of stuff I have tried and like to do. I really enjoy playing around with stained glass. My technique on soldering the foil needs lots of practice! I was surprised at how much I enjoyed working with glass. I was use to working with more forgiving materials. This is a fan light that I designed and made. The name comes from the shape and the small light behind it. I use to think they were something for ceiling fans when I would hear the name. Have a wonderful Thanksgiving tomorrow. I am thankful for all of you! I had to share this goodie...a family at the school my husband works at made these little cookie turkeys. Chocolate sandwich cookies, peanut butter cups, malted mild ball, candy corn, and icing. It was in more pristine condition before the plastic baggie ride home. Very creative I thought. I love lighthouses... and I love eating interesting appearing food. LOL. Have a grateful day today, tomorrow and the next day and the next. So glad to have come to know you through AEDM! What a great light. I have always wanted to try stain glass. Thank you for sharing the Turkey, It is adorable. but don't you think that when the soldering isn't perfect it kind of give it a more personable antiquy old feel, i do! so i am sure if i can see closer i would love it because wheat i see here in this picture is perfect, in fact as soon as open your blog i went she knows how to do this, wow! The light has a great warm feeling to it, and the turkey is so cute! That turkey looks like so much fun. I've got to try it with my little guy! The stained glass piece has such fall colors. Very pretty. Love your site and all your projects. I am like you with many interests. Too bad the "renaissance" man/woman isn't as valued as in the past. Today everybody thinks you have to focus on one thing to be any good at it. But I think some personalities are better suited to variety. If I get stuck on one thing, I can move on to something else and come back to it. Works for me! 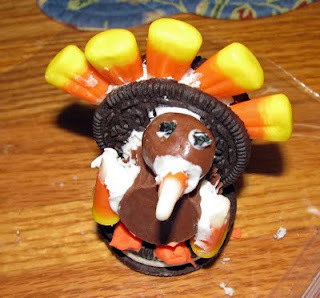 Happy T-Day! How exciting we have kids in the same town. Thanks for commenting on my blog. This is a cool project. It makes me wish I had a little child around still to make these types of things with. My daughter and I did all types of little fun projects when she was little. She is in college now and our projects have changed a bit. That candy turkey is so much fun!!!!!!!!!!! I love this project. 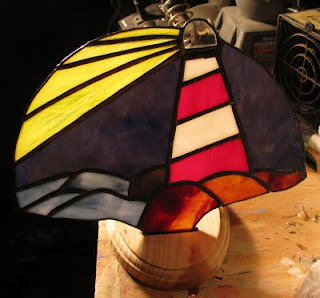 Stained glass has always facinated me, brave of you to try and it really looks good! "Far away in the sunshine are my highest inspirations. I may not reach them, but I can look up and see the beauty, believe in them and try to follow where they lead."